Ho Chi Minh city is a cultural, economic and political center in Vietnam. It is known as a “Pearl of the Orient” which has a modern, vibrant and extremely young beauty combined with many traditional ancient buildings. The climate in Ho Chi Minh City is equatorial, so the temperature is quite high and quite stable in the year. Average hours of sunshine in a month vary from 160 to 270 hours, average air humidity is 79.5%. There are only 2 seasons in this tropical climate of Ho Chi Minh, find out what’s the best time for you to travel to Ho Chi Minh City. Ho Chi Minh City is located in the South East and adjacent to the Mekong Delta, so the climate is divided into two distinct seasons: the dry season and the rainy season. Rainy season usually lasts from May to November. And dry season starts from December to April, this period is known to be the hottest, with average temperature of 28oC. Humidity is moderate in December and begins to decrease from January to April. If tourists travel to Ho Chi Minh city during this period, tourists can escape from the normal sticky weather of Saigon. It is said that, this timing is the best time in year for traveling to Ho Chi Minh city. March, April and May are the 3 hottest months in year, with the average temperature of 38oC. However, in this timing, the humidity is low, it’s pleasant in the morning then becoming cool and windy at night, which makes it much more bearable. December is the coolest month with temperatures in the early morning can decrease to 16oC with light sunshine and mild climate, it has little cloud in the evening, creating cool feeling for tourists. In term of activity, if you visit this city in late of December, you will have chance to experience Christmas and the traditional holiday of Vietnamese people-Tet holiday (New Year). In this month, whole city is filled with colorful decorations, people will hang out and grand sales happening and shopping with family. However, during Tet – Vietnam’s Lunar New Year celebration, around late of January to mid-February, lots of shops and restaurants will be closed, tickets will be fully booked just right before it, and accommodation will be much more expensive. Otherwise, this is a great and exciting time to visit Ho Chi Minh city and see how Vietnamese people enjoy “Tet” festival. Because of the temperature in these months is hot, tourists can travel to many beautiful beaches near Ho Chi Minh city such as: Vung Tau, Phan Thiet, Ninh Chu,… with many water-based activities and enjoy kite surfing down the many sand dines..
From May to November, while the weather is hot and dry in the North, its humid and rain a lot in the South. 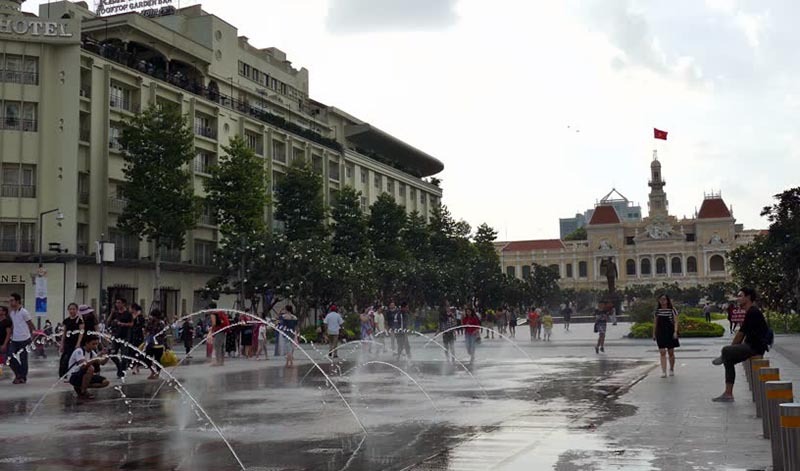 Although dry season is supposed to be the best time to visit Ho Chi Minh city, rainy season still has its own advantages. It will have some short rains per day that clear as quickly as they come, then will have more space for sun, everything will be sort of cleaned up and cooled down. During the rainy season, from May to November, it is quite humid and rainy. There are some national holidays during these months like Vietnam National Day on September 2nd, Vietnam Reunification Day on April 30th for tourists who want to experience the Vietnamese national holidays. 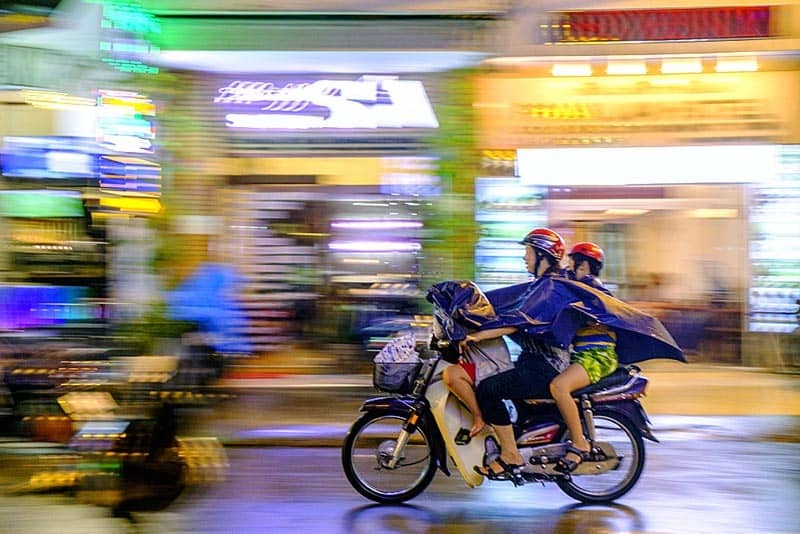 Especially, traveling to Ho Chi Minh city in rainy season will be a delight for tourists who are after an authentic travel experience and exposure to local culture. Rainy season is the off-season, especially from July to November, local people tend to stay at home or go working, and students have to go to school so in this timing, the accommodation prices tend to be cheaper, so it’s good for tourists on a budget.